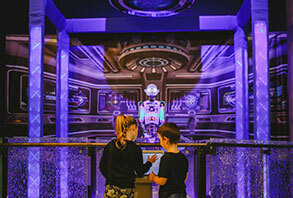 W5 is Ireland’s award winning Science and Discovery Centre. It might be aimed at kids, but we guarantee the adults are in for a fun day too. It boasts a packed-out programme of exhibitions, however with it being Christmas, we couldn’t miss the current ‘WINTERLAND EXPRESS’ attraction, featuring a magical train ride through enchanted forests and icy caves. We even had our first snow of the season! We were transported into another land, the kids absolutely loved it and it really got us all into the Christmas spirit. Once you complete the journey, you can even meet Santa (although this needs to be booked separately). One of the biggest and most impressive exhibitions in the centre is CLIMBIT. This artistic piece of engineering is right at the heart of W5 and is just breathtaking to look at. Don’t just stare though, get right in and climb through the maze to the top, clambering over floating pebbles, higher and higher. It’s a great way to burn off some of the kids’ excitement! Another highlight is the Discovery area, containing 16 themed zones where your imagination can go wild. There’s a life size mini-market where kids can ‘work’ and shop (for free), before building a Formula One Car, playing in a fairytale castle and splashing about in a virtual paddling pool. It’s a sensory overload! You could quite simply spend hours here with little ones. If you still have energy left after all that, you simply must visit the SPACEBASE exhibition. It’s a spaceship themed, multi-sensory soft play area; consisting of giant spider webs, tunnels, launchpads and slides. You’ll love the dedicated seating area for parents to chill out in; fully equipped for you with coffee, snacks and WiFi. W5 is situated beside the Odyssey Arena in Belfast, so there are plenty of eateries you can easily nip out to, be it before, during or after your visit. Admission is valid all day, which means you can take your time and get hours upon hours’ worth of fun – it’s great value for money!